In the synopsis, it mentions that if you liked any of the three books The Night Circus, A Discovery of Witches or Jonathan Strange & Mr Norrell, then you'd love this one too. If I had based my reading selection on this first part of the synopsis, then I might have passed it by. I loved The Night Circus, I have A Discovery of Witches on my kindle ready to read soon but I had to abandon Jonathan Strange & Mr Norrell as it bored me to death! 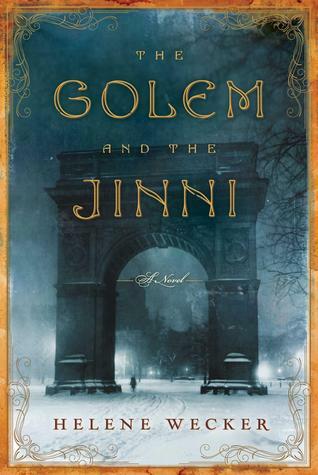 Anyway, I am glad I didn't let this stop me reading The Golem and the Djinni. This book was fantastic! I have no knowledge of Jewish or Syrian folklore so I found those aspects of the story very interesting. This book tells the story of a free spirited Djinni who becomes enslaved and trapped in a flask by a wizard and an obedient slave of a Golem set free when her master dies. Both "arrive" in New York, in a world and culture they do not understand, with their true natures limited by their circumstances. They are forced to lie to keep their true nature from the general populace which in itself causes them problems. Then the Golem and Djinni cross paths, they find solace in each other as each know what the other is feeling, although that doesn't mean they see everything eye to eye as after all, they have opposing natures. Then things turn disastrous and they find their lives are on the line. I really enjoyed the writing in this book. It felt very exotic! And I really liked the characters, I had a really good sense of what they looked like and what they were like as people. I particularly liked the Djinni and the Golem but also the extended cast of characters were very likable too (except the baddie and I despised him as much as I loved the others which is I suppose what you want from a villain). I thoroughly enjoyed this debut novel by Helene Wecker and I will be waiting with anticipation for her next release.